I’ve been back from vacation for two weeks now but I’ve delayed posting this because I wasn’t sure if it would be of good use to anybody. I don’t know anybody who imposes such strict habits regarding their diet as I do. I’m not talking about maintaining strict paleo or being a perfectionist. I definitely don’t worry about that! I am talking about only eating food I prepared myself or that somebody else prepared in a gluten free facility. I know I’ve mentioned this before but I always feel the need to justify my crazy habits – one cross contaminated crumb of gluten will make me very sick for 5-6 weeks at a time. Personally, I don’t like to take that risk. I’m only 110% positive that somebody else out there has it much worse than me and has “crazier” habits too. And if not…. who doesn’t like scoping out what other people are eating? Was that not the sole purpose for inventing Instagram? Lenny and I decided to visit Colorado as a sort of anniversary trip. We have been married three years now! We spent our first part of the trip in the Denver-ish area and the second part around Colorado Springs and auto parts stores…..yeah…. One thing I realized was that Colorado has an overpopulation of Whole Foods. In a good way. Whole Foods is to Colorado what McDonalds is to every other location on Earth. We have two Whole Foods at home and they are within 5 miles of each other. That’s nonsense. What was great about that though is that I didn’t have to transport my own food from home. Literally the first thing we did was go there to pick up some random meals and breakfast for the next day. In case you were wondering, my hotel meals mostly consisted of microwaved pastured eggs (fancy, right? ), Noble Savage meals, canned green beans, and tuna salad (which I could pack up to-go). But let’s get to the fun stuff! 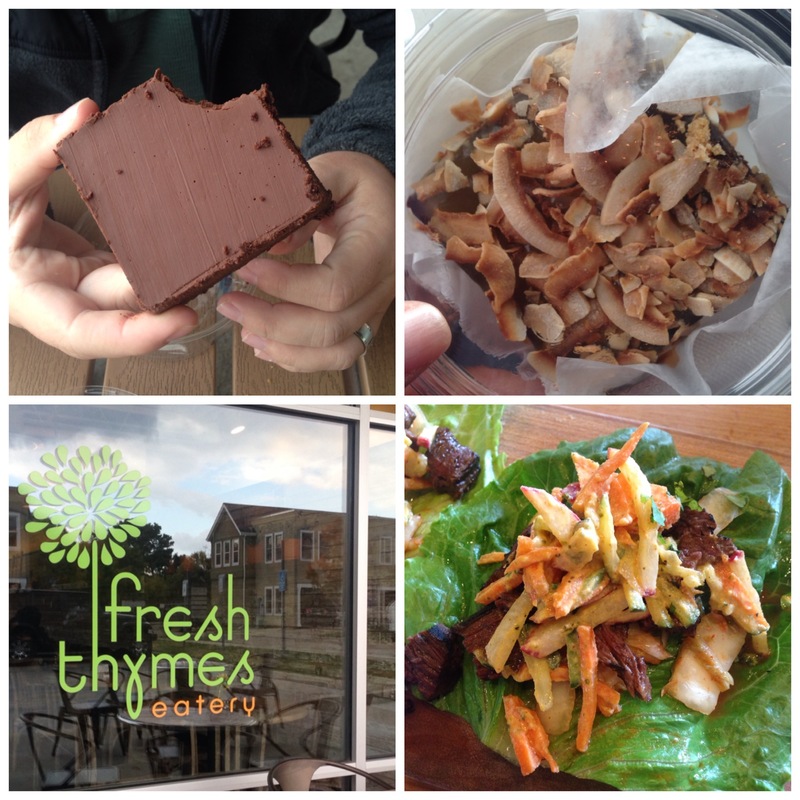 First place I found whose food I trusted was Fresh Thymes Eatery in Boulder. I loved all the paleo options they had! Oh and they had an entire case filled with desserts I could eat. I couldn’t believe it. I kept asking “Are you sure everything’s gluten free?” Talk about food anxiety! My first trip there, I had some lettuce-wrapped steak tacos and a magic cookie bar. 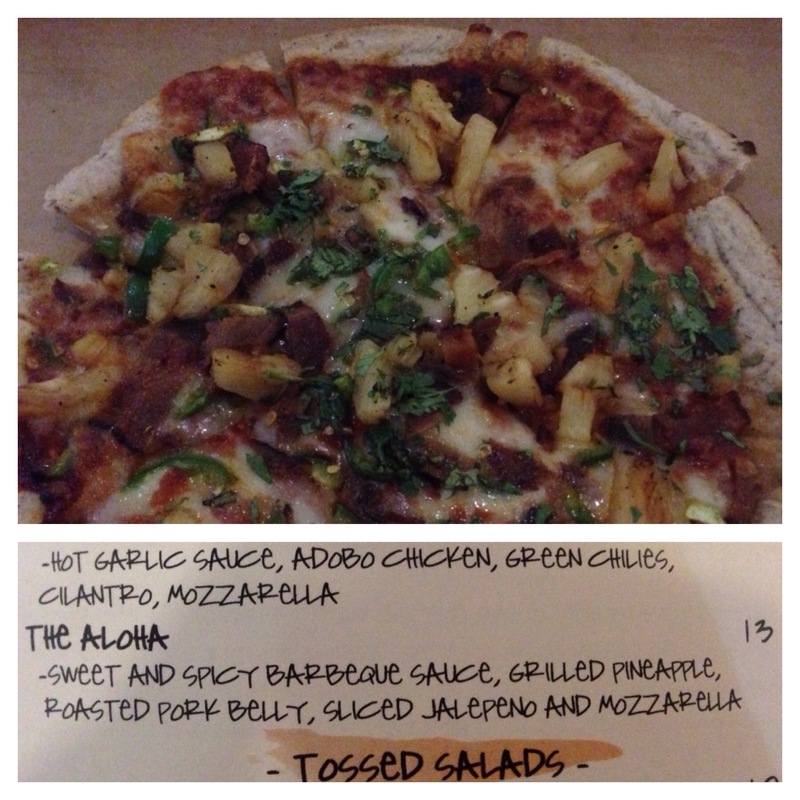 I went back and got this amazing pizza and another magic cookie bar because…wow! 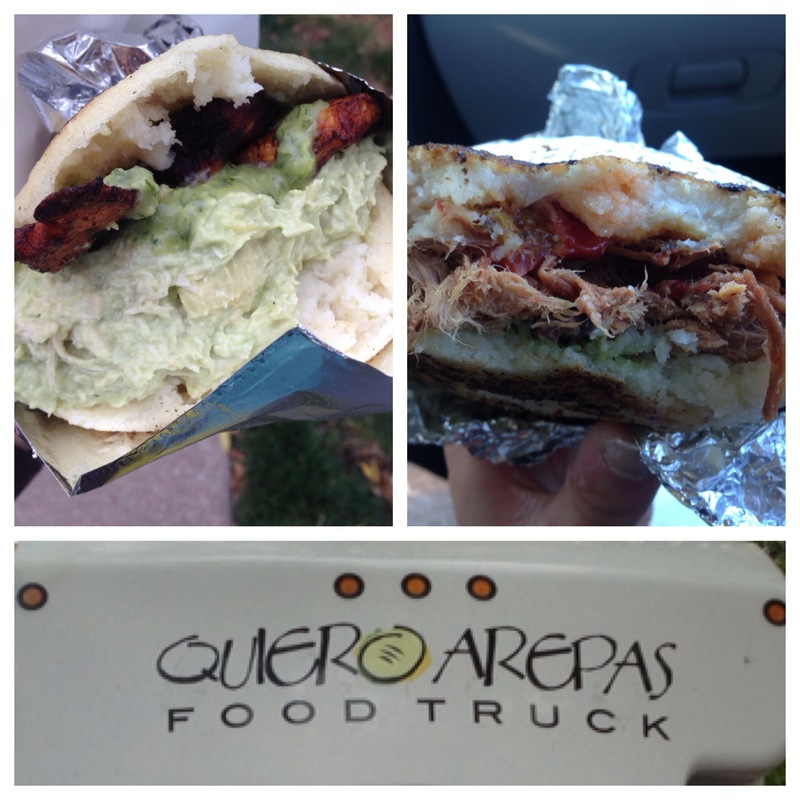 There was also a food truck in Denver called Quiero Arepas. Yes, a certified gluten free food truck! I never thought I would see such a thing. I managed to stop there twice and the second time I picked up both breakfast and lunch to-go because it was pretty much the best thing I had ever tasted. I have no clue what I got but one involved chicken, avocado, and citrus dressing and the other involved shredded beef, cheese, fried plantains, and other delicious things. 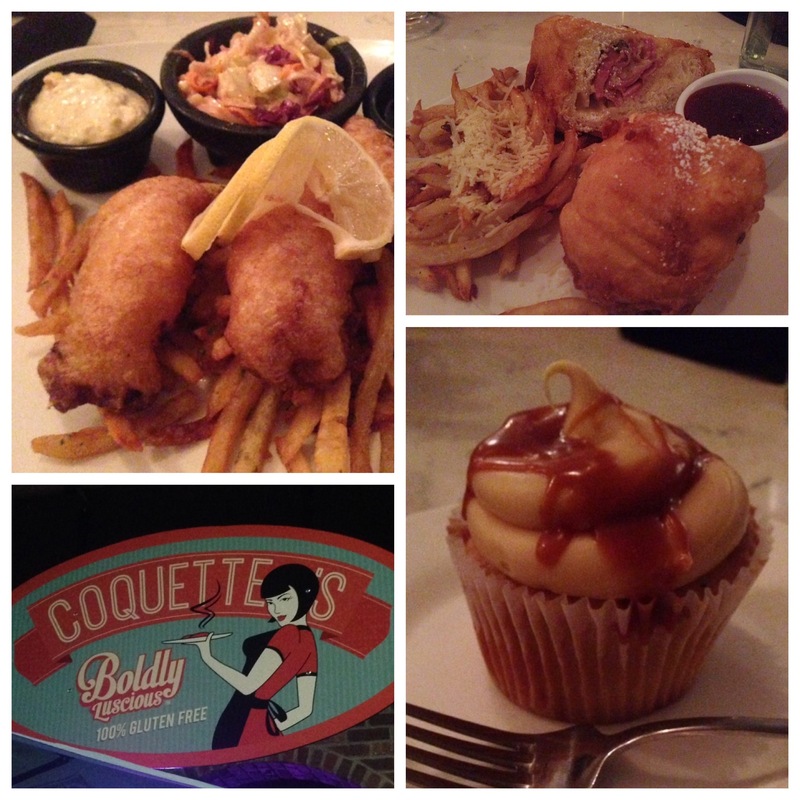 During the successful part of our stay in Colorado Springs, we ate at an amazing restaurant called Coquette’s. They had a huge menu including breakfast, drinks, and bakery items. You would never realize you weren’t eating gluten there. Everything tasted like I remembered it – even the flaky crust on Lenny’s pot pie! Looking at the menu, Lenny immediately knew what I would order – the monte cristo sandwich with truffle fries. “Ham and swiss in a battered deep-fried hoagie, side of strawberry preserves, and powdered sugar”. This is what my friends and family refer to as “Meagan food” – food that blurs the line between dinner and dessert. I gave most of that up after going paleo but every once in a while the maple syrup on my paleo pancakes finds its way over to my eggs and hash browns. I also got a hot chai latte and we split bread pudding for dessert. We went back on our last day and I got the cider battered fish ’n chips and a salted caramel cupcake. So I definitely didn’t eat paleo the entire trip. I may have taken it a little far though. I can usually have a small gluten free grain based treat without issues except maybe a little tiredness. Larger treats (like that pizza) or frequent treats will make my joints swell up and hurt a lot as well as make my psoriasis break out. It also makes me incredibly thirsty and tired. The joints in my hands stopped hurting the day we got home but it took over a week for the knee pain to stop. Based on prior experience, since the psoriasis is back, it will take at least a month to heal. But I don’t regret anything. I enjoyed myself and I feel the minor health setbacks were completely worth it. Heck, I used to live with much worse every day! My main concern was staying safe. I could have ordered paleo at anyplace I ate but I may never have another opportunity to go to a restaurant and order literally anything off the menu without asking the server a thousand questions while being in a state of total panic. So I ordered whatever I wanted. It was a really interesting experience. I thought eating out would feel strange and exciting since it’s been so long. It just felt really familiar. And normal. And that made it perfect. I’m glad you had a good time but the a new Subaru as a souvenir is going a little overboard!